As Spring approaches, it's time to start making plans for SLO County's annual tribute to the "classic American wine grape" -- Zinfandel. More than 100 wineries will host an array of special events throughout Paso Robles Wine Country during the Zinfandel Festival weekend, March 20 – 22. Weekend festivities include, winemaker dinners, food pairings, seminars, open houses and special tastings. According to Wikipedia, "Certain California regions are regarded as 'exceptional' for Zinfandel, each with identifiable flavor characteristics. San Luis Obispo, particularly the Paso Robles AVA with its hot days and cool maritime evenings, produces Zinfandel known for being soft and round." Saturday's "Grand Tasting" takes place from 7 - 9:30 at the Paso Robles Event Center (aka: the Mid-State Fairgrounds), 2198 Riverside Avenue, Paso Robles. 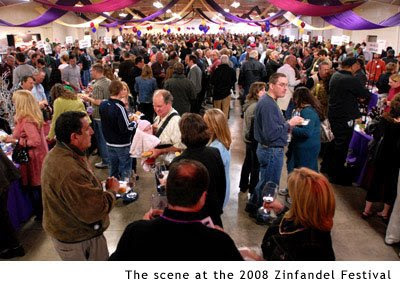 New in 2009 is the addition of "RESERVE," featuring the region’s best Zinfandels, held on the eve of Zinfandel Festival. The Wine Country Auction held on Saturday features packages only available on the auction block. Directly following the auction is the Grand Tasting, featuring selections of Zinfandel and Zinfandel blends from more than 40 Paso Robles producers. Local chefs preparing cuisine to pair with, of course, Zin, completes the Festival experience. Weekend Hours: 12 - 5 p.m.
Friday - Sunday: Be prepared to add some pizzazz to your life when you visit a tasting room like no other! Think Edward Scissorhands meets the Mad Hatter at the Moulin Rouge. Enjoy our garden's winding paths decorated with mosaic spheres, cubes, metal sculptures and rock circles! Saturday: Join us for our famous grilled chipotle hamburgers served with our 2004 Syrah, complimentary with your tasting from 1 - 4 p.m. mmMMM Scrumpdeli-o-cious! While you're here taste our new release 2007 Roussanne and take advantage of our 2004 Syrah which will be discounted 50% for this weekend only. Weekend Hours: 10 a.m. - 5 p.m.
Friday: Weekend Guest Chef Charlie will prepare a delicious assortment of appetizers paired with our best estate varietals at 6:30 p.m. $45/pp; $35/Club members. Reservations required. Saturday: All weekend we will feature several new releases as well as a sneak preview of our new "tasting room only" wines. VIP tour and tasting for Club members at 10 a.m., 12 and 2 p.m. No reservations required. Sunday: Let Chef Charlie tantalize your taste buds with a food and wine pairing beginning at 11 a.m., followed by a VIP tour and barrel tasting. $60/pp; $50/Club members. Reservations required. Weekend Hours: 11 a.m. - 4 p.m.
Friday - Sunday: Stephan and family welcome you to visit the winery and enjoy his artisan, handcrafted "Paso blends" Optimus and Estate Cuvée. A vigneron first, Stephan focuses his energy on his high-density planted, low yielding vineyard. As if tending a rose garden, he cares for each vine separately, coaxing just eight clusters on average from each, the result of exhaustive shoot thinning and cluster dropping. In the winery, non-intervention is key to retaining the character produced in the vineyard. Come and let him tell you his story over a glass of wine! Friday: Join us for our 8th Annual Zinfandel Winemaker's Dinner. Enjoy four incredible courses paired beautifully with some of Opolo's best. This event sells out every year, so call today. Saturday & Sunday: What goes best with an Opolo wine tasting? A barbecue, that's what! Stop by the tasting room and enjoy whole roasted lamb, spicy tacos, beans, salad and much, much more. Lunch $10/pp. Wine tasting $5/pp. Saturday: Join 16 Far Out Wineries on a unique "Walkabout Zin Tasting" in the caves at JUSTIN Winery. Meet the "Makers," attend breakout seminars, enjoy appetizers and more! 10 a.m. - 1 p.m. $55/pp. 805.237.0138 for more information and reservations. Weekend Hours: 11 a.m. - 5 p.m.
Friday - Sunday: Escape the crowds and come down to Santa Margarita to taste our award-winning Zinfandels paired with hors d'oeuvres, along with many other wines Pozo Valley has to offer. Meet the family and hear our story behind this limited production winery. Our Downtown tasting room is only 1.5 miles off of Highway 101 - take the Santa Margarita exit. Complimentary tasting and wine discounts all weekend. And... think SLO County is the only place with "Zin-atics?" Think again. Check out this article, where the Merced Sun writes about the "more than 275 wineries pouring more than 550 samples of just one grape variety in a single day," at the 18th annual Zinfandel Advocates and Producers (ZAP) Festival in San Francisco, on January 31. According to ZAP officials, more than 10,000 people were in attendance. J. Lohr, Finalist in Wine Enthusiast Magazine's "American Winery of the Year"
J. Lohr was one of only five finalists in Wine Enthusiast Magazine's "American Winery of the Year" for 2008, with the top award eventually going to Korbel Champagne Cellars. Only five producers were nominated for American Winery of the Year in 2008. Joining J. Lohr Vineyards & Wines, and Korbel as nominees were Rodney Strong Vineyards, Shafer Vineyards and Sineann. "Each of the nominees was worthy of this award; the caliber of excellence represented by this group shows how competitive the American wine industry has become," commented Gary Heck, Korbel President and Owner, at the 9th Annual Wine Star Awards gala dinner, held January 26th in New York City. Wine Enthusiast Magazine created the annual Wine Star Awards to recognize leaders in the crafting, marketing and distribution of wine and spirits worldwide, and highlight achievements of the past year. The Paso Robles Wine Country Alliance honored Stephen Miller and Family as the 2008 Wine Industry Person of the Year during the organization’s 17th annual Gala held January 30, at the Park Ballroom in downtown Paso Robles. Miller, along with his late brother Bob, began their vision for the Central Coast wine industry in the early 70s. From growing world-class grapes at French Camp Vineyards to establishing Paso Robles Wine Services, a full service processing facility, the Miller Family champions the Paso Robles American Viticulture Area (AVA) working with more than 150 brands. The Miller Family vision for the region began in the late 60s with the purchase of the Camatta Ranch and the decision to plant wine grapes in the early 70s. French Camp Vineyard is home to more than 1,700 vineyard acres and 30 different varietals. The client list for the vineyard extends to more than 75 wine brands with 20 vineyard designated French Camp wines. Paso Robles Wine Services was created in 2002. Home to more than 40 wineries, the full service facility also offers case good storage, barrel storage and vendors located onsite who offer direct-to-consumer shipping, trucking and sensory/laboratory services. Since mentioning Talley Vineyards' interesting on-line "Winegrowers Log" here last month, they have already advanced their technology, and added videos of their work in the vineyard. The first two installments, at this link, include, "Pruning chardonnay at Talley Vineyards," and, "Pruning pinot noir at Talley Vineyards," where Brian Talley, and Vineyard Manager, Kevin Wilkinson (pictured, with Winemaker Leslie Mead), discuss and demonstrate the pruning techniques they use for the vines. Despite recent economic news, the outlook for the state's wine and grape sector remains fairly sunny, according to speakers at the annual Unified Wine and Grape Symposium. About 12,000 people attended the annual symposium last week in Sacramento, many packing the session on the "State of the Industry," for analysis of sales and the market outlook for 2009. According to reports, the take-home message for winegrape growers is that supply and demand are roughly in balance, and with a 2008 crush estimated at about 2.8 million tons, there may be a slight supply shortfall going into the next crop year. And, in other economic news related to California's wine industry: The effort to balance California's $41 billion budget deficit finds itself in wine country. Governor Schwarzenegger has proposed raising the state's excise tax on wine. Currently, Californians pay 4 cents per 750 milliliter bottle. But if the governor has his way, the cost could jump to nearly 30 cents for that same size bottle. The idea has many in the industry concerned. "To target a specific industry, especially an industry that's growing and thriving, one of the leading industries -- and to target an agricultural industry? I think is just not the approach to go," said Stacie Jacob, spokesperson for the Paso Robles Wine Country Alliance. According to reports, the wine industry in San Luis Obispo County alone contributes $1.8 billion into the economy and employs 8,000 people. Jacob adds that a tax like the one the governor is proposing would hurt the wine industry on the Central Coast. "It really is one of the largest thriving industries in our area, and to have a tax like this is really one of those threats that could be detrimental to the industry," says Jacob. Finally, in case you missed it, last month, 60 Minutes' Morley Safer did a great story on how scientists have found a substance in red wine that is slowing down the aging process in mice. Will it someday lengthen the lives of humans, too? Morley Safer reports at this link.